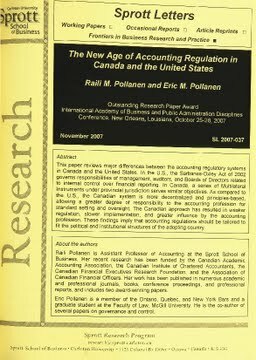 R. Pollanen (Raili) and Pollanen, Eric M.
This paper reviews major differences between the accounting regulatory systems in Canada and the United States. In the U.S., the Sarbanes-Oxley Act of 2002 governs responsibilities of management, auditors, and Boards of Directors related to internal control over financial reporting. In Canada, a series of Multilateral Instruments under provincial jurisdiction serves similar objectives. As compared to the U.S., the Canadian system is more decentralized and principles-based allowing a greater degree of responsibility to the accounting profession for standard setting and oversight. The Canadian approach has resulted in weaker regulation, slower implementation, and greater influence by the accounting profession. These findings imply that accounting regulations should be tailored to fit the political and institutional structures of the adopting country. Pollanen, R, & Pollanen, Eric M. (2007). The New Age of Accounting Regulation Canada and the United States. Sprott Letters, November(2007).